That’s another two obstructions ticked off the Hogsmill list with fish passage successfully being restored to this stretch of the river. 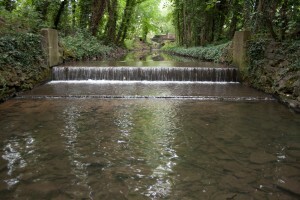 Since the last blog, when the downstream weir was in the process of being removed, things have moved on dramatically. Before I explain what has been done, first a quick good news story. 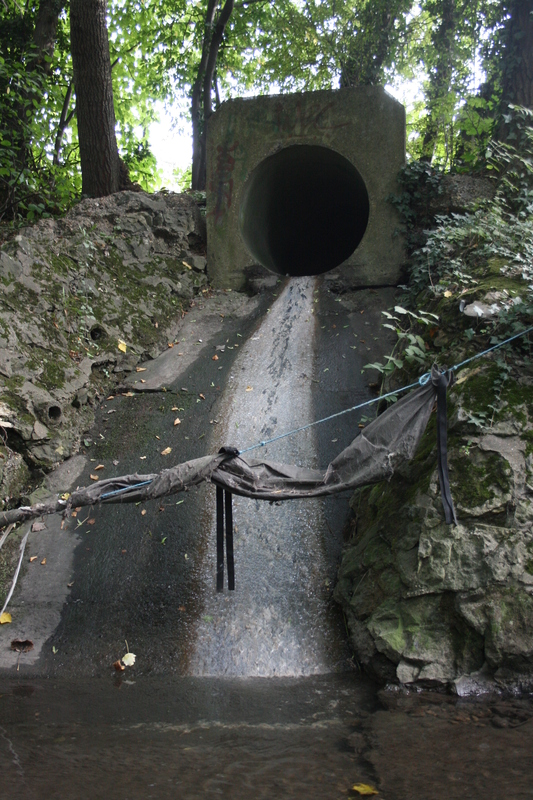 At the top of the stretch a surface water outfall discharges into the river next to the bridge footing. Every day, large quantities of fat and food matter were entering into the river from this due to a clearly misconnected pipe up the system. You can see the severity of this from the photo, although without scratch and sniff you will have to take our word on the pungent aroma. I reported this to our local Environment Agency Pollution Officer and in double quick time they had been out to site and identified the source as being the kitchen sinks in the pub over the road. The pub was unaware of the misconnection and has agreed to rectify the issue by connecting the sinks into the foul sewer and not the grey water. 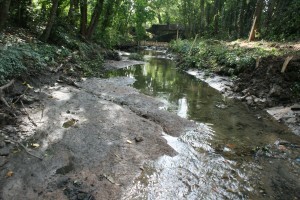 Misconnections are a big problem and cause poor water quality in urban rivers. 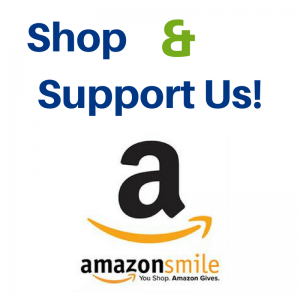 Click here for help to identify if your house is misconnected. Back to the main works, with the weir gone, the impounded water drained away revealing the river bed that lay beneath the deep, dark and sluggish water for so many decades. What became immediately clear was the impact that excessive historical dredging has had on the river. The true scale of the river at this point was made apparent. 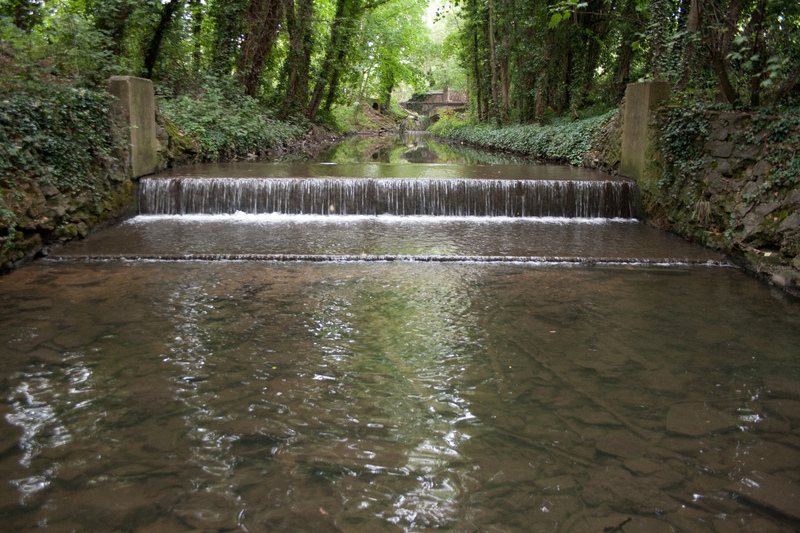 The facade of being a large, deep river was lifted and the reality of the stream which the Hogsmill really is at this point in its journey unveiled. 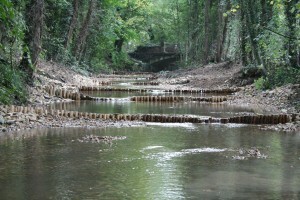 A river, no more than a metre wide snaked its way in the bottom of the 10 metre wide channel. 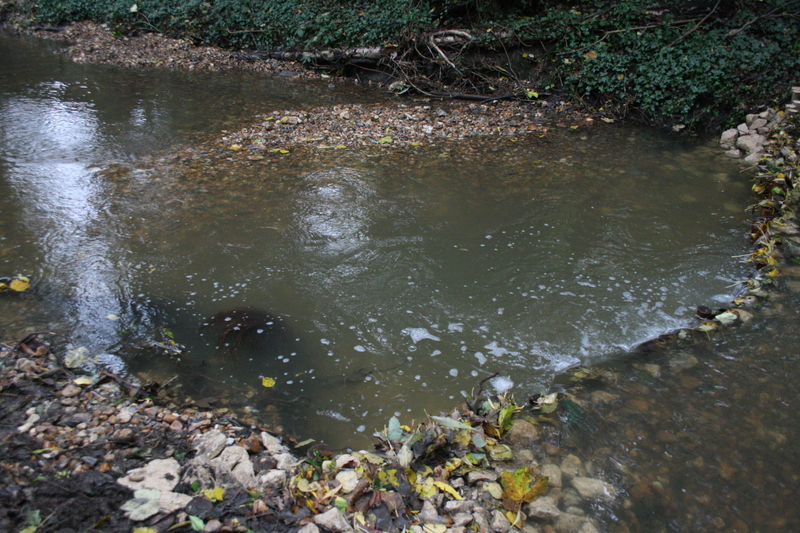 Admittedly the chalk fed source of the river 3.5km upstream will be running low at this time of year but the river looked markedly out of place in the over-sized channel. Nine rows of chestnut posts were driven in, crossing the channel in shallow curves at regular(ish) intervals down the 90m stretch of river. In total 700 posts were used as I am sure the guys on site will testify to. The introduction of gravel then commenced. Large flints were hand placed behind the posts to prevent washout and maintain the head across each pool. As the deliveries of gravel came in, quantities of these large flints were irregular and lacking. A decision was made to substitute these for more uniform, larger gabion stones which would assure the longevity of the structures. This was also banked up at the outside edge of each line of posts to prevent the river from eroding the banks. The gravel orders were repeatedly made and delivery after delivery entered the yard. These were loaded onto the tracked dumper and moved to where they were needed in the river before being placed with the excavator. Trip after trip, tonne after tonne, the gravels were moved and introduced. The dredged channel appeared to eat the gravel up without as much as a burp. It rapidly became clear that our 200 tonne allocation was looking decidedly insufficient. Without more gravels the river would be passable, however the habitat would be lacking with wide, deep, sluggish pools similar to that of before. The budget was checked and with a groan it relinquished more funds. By the close of play, 360 tonnes of stone have been introduced and the transformation now complete, although further narrowing and planting would help this stretch further but with budgets as they are this will have to wait. The upper line of posts has drowned out the bridge footing, providing a depth of approximately 300mm for fish to pass. From here, each ramp reduces the one metre head over the length of the site in approximately 100-120mm increments. The water now flows through the low flow channel in the form of a beautiful, streaming, passable flow. With the works completed last Friday and with no time to settle in the site was brutally tested by the apocalyptic weather that we experienced at the weekend. With bated breath I pulled up on-site this morning and was pleased to see that it had passed, everything was where it should have been. 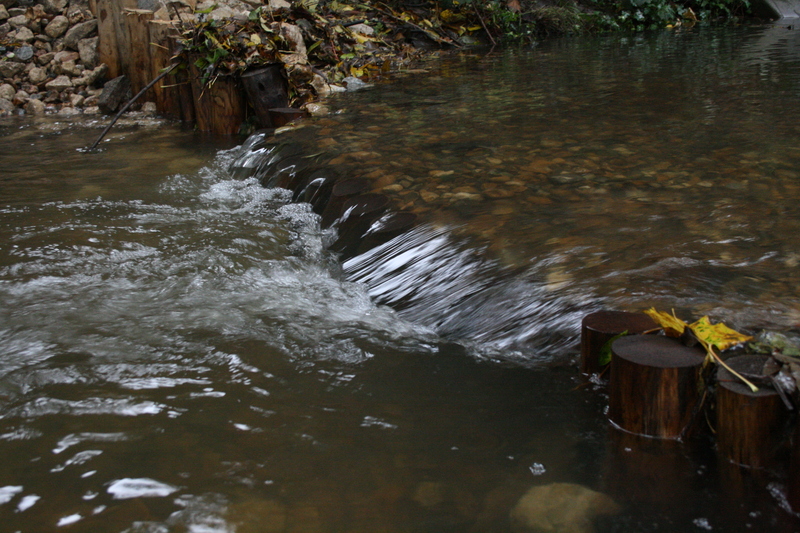 The river has started to react positively to the works. 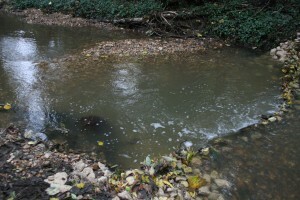 Deep pools have been scoured out, kicking the gravels up to form shoals and riffles. The varied positioning of the low flow notches in each line of posts are creating a sinuous, meandering channel. Already a mosaic of habitats are being created which will provide the required niches for various inhabitants of the river to occupy. The rubbish strewn, brick filled bed has now been replaced with nice clean gravels. 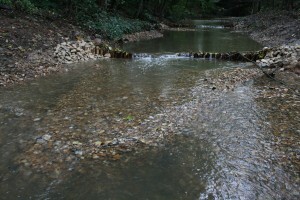 Fish can now freely migrate up and downstream as they choose. A few tweaks will be required to the levels as the river adjusts and settles into its new form but essentially the job is done. A big thank you to Chris at Woodland Environmental for kindly allowing us to access the river through their site, without this we really would have struggled. Thank you also to Cain Bio-Engineering http://www.cainbioengineering.co.uk/ for helping with the design solution. And a huge thank you to the guys from Aquamaintain (http://aquamaintain.com/), Ben Kavanagh, John Mudd akaNorthern, Nick Gibbo Gibbs’on’ and Keith. They stoically took on every one of the 700 posts, laughed in the face of each of the 370 tonnes of stone and worst of all had to put up with me for a week on site (it beats being in the office). They took pride in their work and have carried out a fantastic job with great effect. If you listen carefully enough you can hear the faint sound of fins clapping in gratitude. 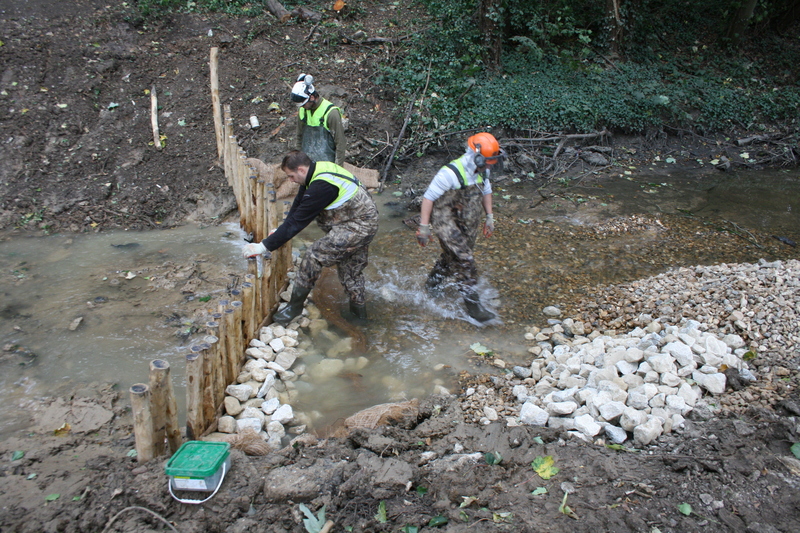 This entry was posted in Uncategorized and tagged Hogsmill, River restoration on October 21, 2013 by Toby. Awesome work, Toby – those structures are already bedding in beautifully!